Elon Musk/SpaceX via InstagramElon Musk’s 2008 midnight-cherry-red Tesla Roadster sits inside the carbon-fibre fairing of SpaceX’s first Falcon Heavy rocket. Elon Musk said on December 1 that he’d launch his old red Tesla Roadster toward Mars. While Musk said he was serious, doubts have lingered. 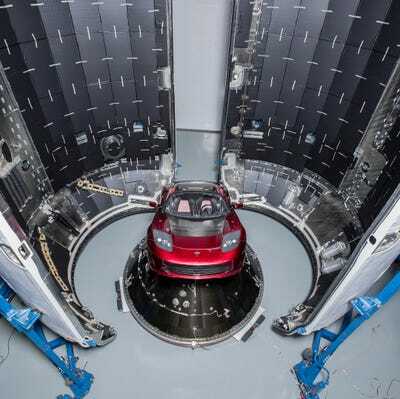 But on Friday, Musk posted a photo to Instagram of the Tesla inside a rocket nosecone. The rocket is SpaceX’s brand-new Falcon Heavy launcher, scheduled to fly in January. In a series of tweets on December 1, Elon Musk, the tech billionaire who founded SpaceX, said he planned to launch a Tesla electric car to Mars orbit in 2018. Musk toyed with the popular press, first by confirming his plans with The Verge, then backpedaling, then again confirming it with Ars Technica and several other media outlets. But if Musk had left any room for doubt, it is now gone. 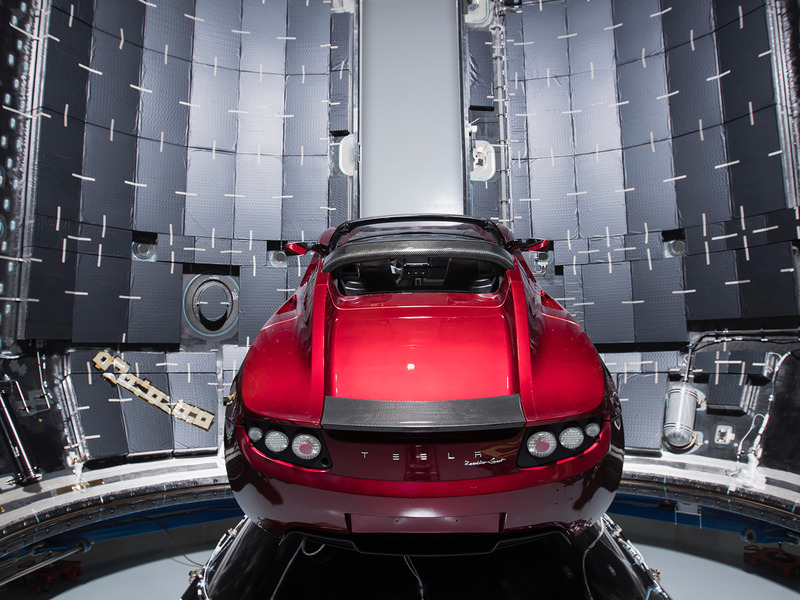 On Friday afternoon, he posted a striking photo on Instagram of a 2008 red Tesla Roadster sitting in the carbon-fibre fairing of a Falcon Heavy rocket – just as he had promised. “Test flights of new rockets usually contain mass simulators in the form of concrete or steel blocks. That seemed extremely boring,” Musk wrote in his Instagram post. “Of course, anything boring is terrible, especially companies, so we decided to send something unusual, something that made us feel. SpaceX/Elon Musk via TwitterThe three-booster Falcon Heavy rocket in a hangar at Cape Canaveral, Florida, in December. Earlier this week, Musk revealed photos of the first Falcon Heavy ever built inside a hangar in Cape Canaveral, Florida. 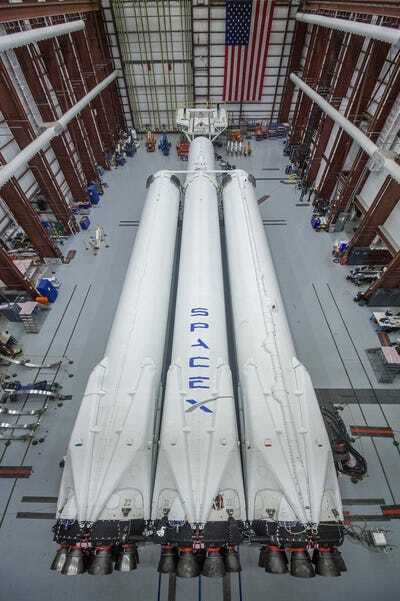 The 230-foot-tall three-booster rocket is scheduled to make its maiden launch no earlier than January. But the reusable-rocket system is noticeably missing the clamshell top, or fairing, in the images. Musk had demanded to be taken seriously before releasing the crucial photo of that missing part, though. 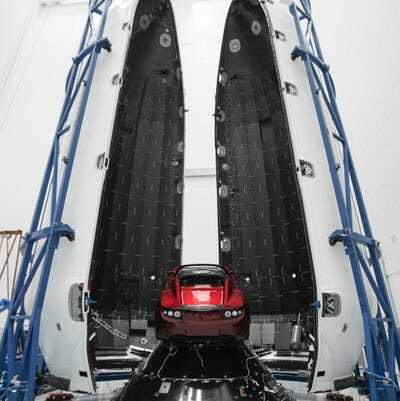 For example, Musk previously said he planned to launch the “silliest thing we can imagine” on Falcon Heavy’s first test flight. And in 2010, he launched a wheel of cheese into orbit during the maiden voyage of SpaceX’s Dragon spaceship. Falcon Heavy is also up to the task: SpaceX says it can ferry a payload of 37,000 pounds – roughly 14 Tesla Roadsters’ worth of mass – to Mars. 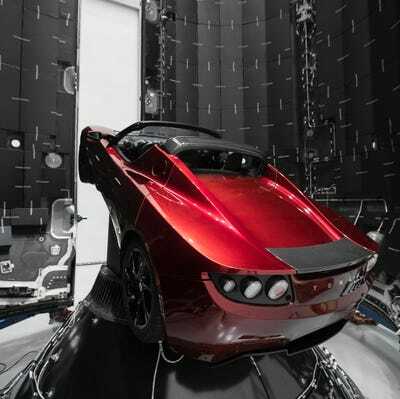 “Red car for a red planet,” Musk said in a Twitter reply in early December. 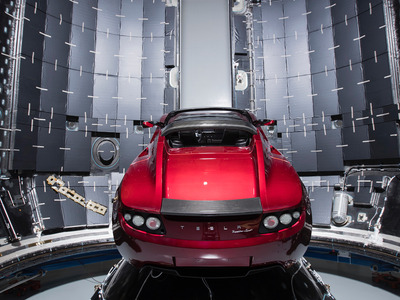 The Tesla won’t be going to Mars, as Musk told Phil Plait, an astronomer and writer. Instead, Plait wrote in a post for SyFy, it’s “going near Mars,” specifically in what’s called a Hohmann transfer orbit, a highly elliptical path that goes out to Mars orbit and back to Earth orbit on a nearly endless loop – hence the “billion year” detail from Musk. Musk also told Plait he was willing to consider launching other objects inside the Tesla suggested by the public. 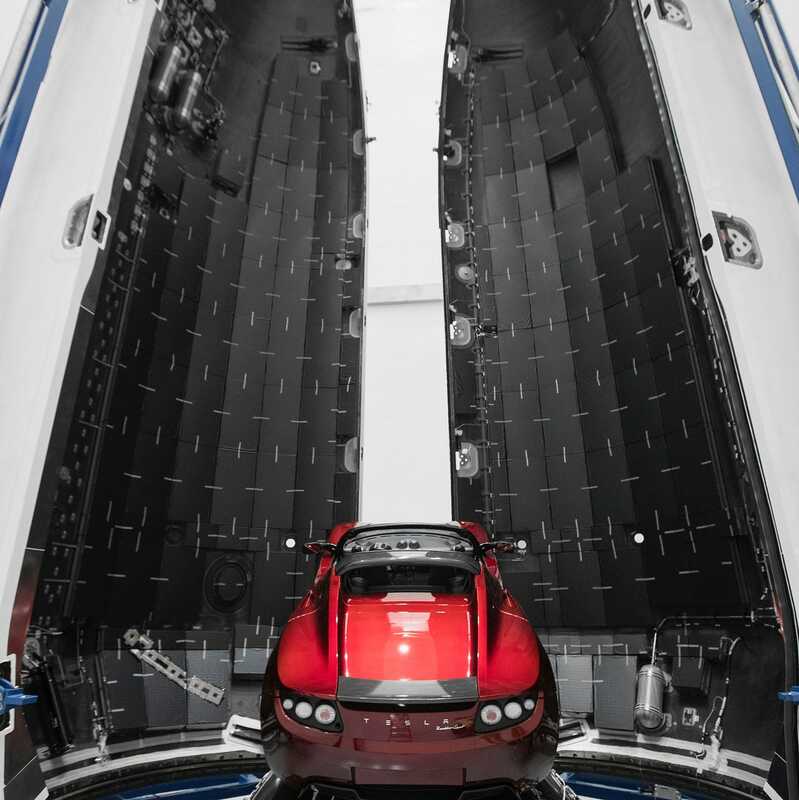 Below are other photos Musk posted of the Tesla inside Falcon Heavy’s fairing. Falcon Heavy’s fairing stands dozens of feet tall and is made of lightweight yet incredibly strong carbon-fibre composite materials. As with most rockets, payloads have to be carefully balanced inside a fairing to prevent damaging and leaning the rocket askew during flight. … Though it may just be for a better through-the-dash-window camera angle. 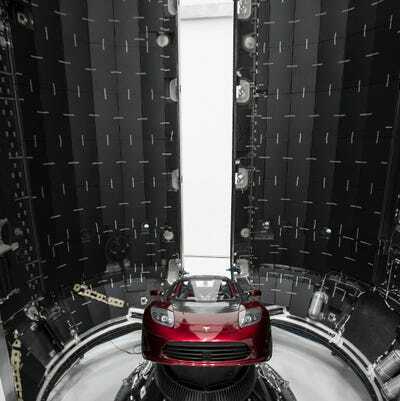 If successful, Musk’s car will be the first ever to fly free through the vacuum of space — and one of the longest-lasting legacies of the human race.